Our heroes return to Taldor to investigate a murder, root out a shadowy cabal, and finally restore order in the conclusion to the War for the Crown adventure. A press review copy of the module was provided. Find more Roll20 Reviews on my website and YouTube channel. Support my reviews via Patreon. 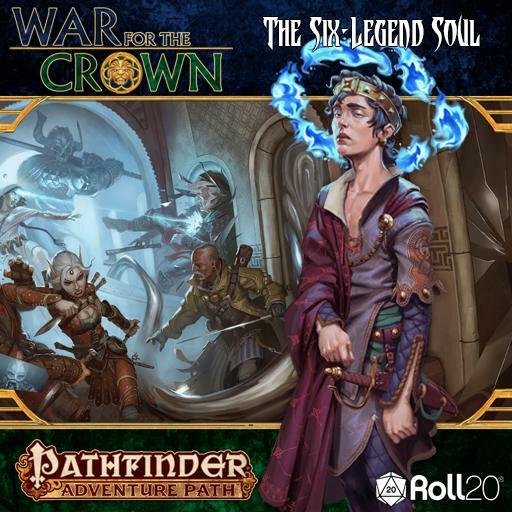 It’s been a long journey but we’ve finally reached the end of the War for the Crown Pathfinder Adventure Path with the release of “The Six-Legend Soul” on Roll20. The module designed for 16th level PCs who have completed the rest of the War for the Crown adventure, and features an emotional murder investigation, the discovery of an evil organization, and the culmination of the PCs’ heroic work in Taldor.